Have you ever touched kinetic sand? It has the coolest most addictive texture. Sometimes I find myself playing with it when the kids aren't around. Learning and exploring is more fun when there are cool textures involved. We combined beads, pipe cleaners, and kinetic sand to make a rainbow hunt that is perfect for strengthening little finger muscles. Set up for this activity is really easy. 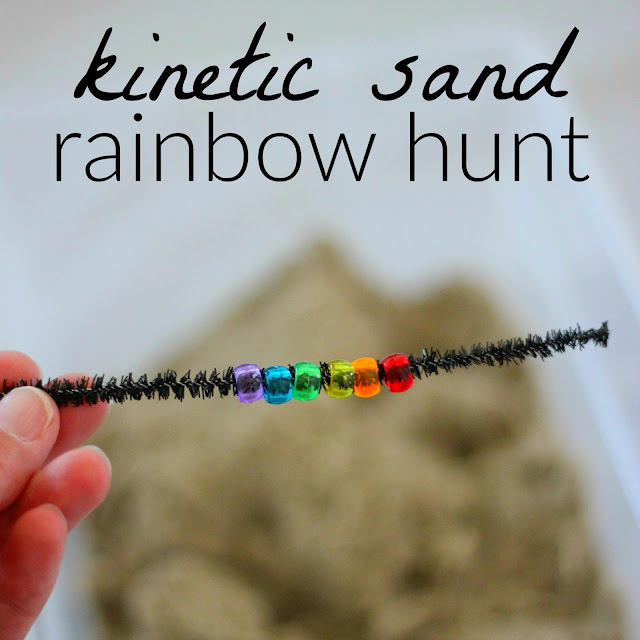 Put some colorful pony beads in a plastic tub and add in kinetic sand. Mix it all around and hide the pony beads! They will get sand inside the holes. That is okay. Next put some pipe cleaners in another plastic tub. Show your kiddos how you can dig in the kinetic sand and find beads and then thread them onto the pipe cleaners! 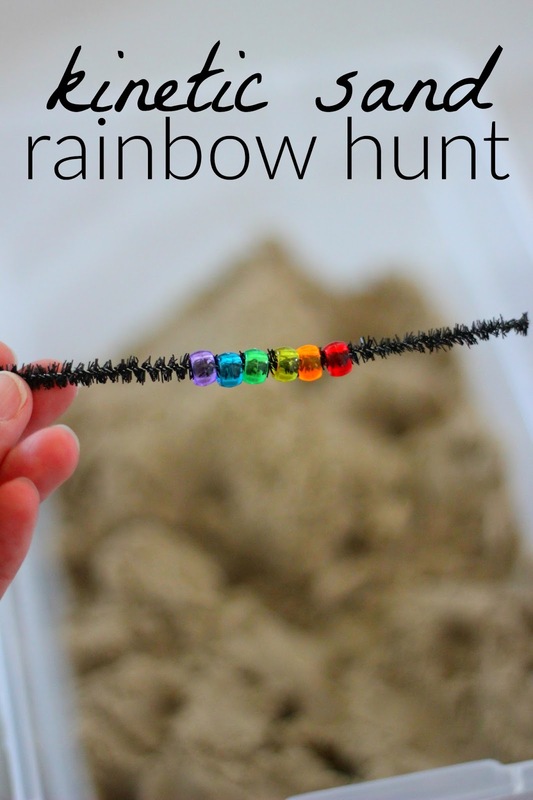 I put a little rainbow visual card in the plastic bucket and encouraged the kids to try and build a rainbow with beads and pipe cleaners. We set this up yesterday afternoon and all three of my kids had fun playing with it! We also made bracelets with patterns and we tried to cover the entire pipe cleaner with beads. Threading and digging for the beads is a great way to build your finger muscles. Strong finger muscles are needed for all sorts of fine motor tasks like buttoning, zipping, and writing! Find more fine motor ideas on our Fine motor fun pinterest board. Find more rainbow activities on our St Patrick's Day pinterest board.